I said last time I would look at the software and firmware for this post but I decided I needed to spend more time on the regulator to address the DC response issues I had observed, I felt this was more important to get right so this article focuses on that. The good news is, I have achieved good results and I believe the regulator design is complete – at least for the high current version of the module (0-8V 0-8A). I had problems with the regulator over shooting by about 500mV when transitioning from a high power load to a low power load. There were two main problems, the first was down to the inductance of the wiring on the output, that creates a problem which in turn was amplified by the relatively slow response of the various amplifier stages. I have achieved significant improvement on my previous measurements by tuning response times through the various stages, this simply required lowing the impedance through the various stages to ensure the servo was able to respond more quickly to changes on the output. This was achieved by adding C24, C25, C39, C40, C41, C43, C45, C46, C47 and C48 to the input and driver stages. I also needed to throttle back the fast rise time of the control drive from the DAC to follow behind the response curve of the regulator circuit. These changes mean the regulator now delivers a clean and very acceptable dynamic response to fast-switching load conditions. Here is the latest schematic which is at version 0.7 including all of the latest changes. The most significant changes are on sheet 3. I now need to lay out the new PCB and get some ordered, I will do this over the next couple of weeks. I will definitely cover the development environment and the firmware in the next post as well as the serial protocol used to control and monitor the module. Will boards be made available and possibly parts or just a BOM ? Eager to get one of those boards ;o) Fantastic stuff. Proportional control itself won’t control to 0 error, so you’ll need to use PI at least. To tune a PI you generally start with the P then do the I. The proportional gain is Rfb/R41, and the integral time constant is 1/(R41*C27), I think. So they should be decoupled. 1. Tune the P first (put a very large C27 to remove the effect of the integrator). Then find the value of Rfb at which the response becomes unstable (you will probably need a few POTs ranging from 1k to 100k), you’ll want to try about a thrid to half this resistance for the next step. 2. Decrease C27 untill the response is acceptable. 3. Play around a bit more, i.e. start with slightly different Rfb. 2. Use the derivative cap to reduce the overshoot. 3. Reduce C27 to reduce error. http://mackys.livejournal.com/663317.html This is the topology I suggest… there are more complex ways, that involve more opamps too. If you remove C1 you will have a PI controller, if you include C1 you have a PID controller. Another way to look at your current integrator circuit is from a purely high frequency perspective (as it’s the high frequency component of the fast transients that we want to control). For this theoretical exercise we assume all the capacitors are short circuits. An opamp with 0 feedback impedance (at high frequency) will be unable to pass through any high frequency error; it will hold everything at 0V. Putting in the bypass capacitor is increasing the available magnitude of the high frequency signal in the vain hope that the opamp can amplify it. Once you put resistor in series with the feedback capacitor and repeat the theoretical exercise at high frequencies, there is now still impedance in the feedback path and the opamp can amplify the incoming signal. The basic theory of a PI controller is the proportional gain provides the fast response while the integrator removes the steady state error. Proportional gain is just the non-frequency dependent gain. i.e. the proportional gain acts accross the full frequency spectrum (up to the opamps GBP) just like a normal opamp. The integrator only provides substantial gain to lower frequencies, however its phase shift will limit how fast you can set it. Kp = R2/R1 defines the proportional gain. tau_r = R1*C2 defines the integrator time constant, or Ki = 1/(R1*C2) defines the integrator gain. If C2 is large Ki is very small, the effect of the integrator is small. Kd = R2*C1 defines the derivative gain. If C1 is removed Kd = 0, there is no derivative gain. The frequency response is determined by all of these parameters (as well as the rest of the circuit). Start with a nominal R1 and very big C2 (100n should do, bigger the better) and vary R2 for instability then take a fraction of the unstable R2 (1/3rd, 1/2 around there). I’m not sure what range value it will take, it could be similar magnitude to R1, or an order of magnitude either side (or more). You can also vary R1 at this stage too. You won’t have 0 error, but you should have a fairly fast response with no overshoot or oscillation. Reduce the size of C2 until no error. 1. With no C1 (and a nominal R1), put in a very big C2 again and vary R2 until you get a fast response with some overshoot. 2. Add a small C1 and increase its size to eliminate the overshoot. 3. Decrease the size of C2 to remove steady state error. I’m a little surprised it slowed down the response. There may be other more complex interactions occuring (with other plant time constants). I suggest starting the error amp from scratch if you want to play around in detail. You’re intuitive understand is good! But I find it very hard to just randomly change gains and get a better response. Too much of one gain will mean you won’t be able to put in any other gain. I also forgot to mention that you may need to also consider the effects of C44 and C45. I would remove them for the PI tuning process, then asses again after. Resistors don’t really decrease the frequency response of the circuit, unless you know they are feeding capacitive loads large enough to cause long time constants (whats the input capacitance of your FET?). However they will impact the phase margin of the circuit. I also, also forgot to mentionk, these tuning techniques are generally for a step change in command/reference. Since I think you were doing a step in load it will be more difficult! Correction, the rise time is about 2uS so not the 50nS I stated, I must have been looking at something else! There may be other interactions going on too to look out for – opamp saturation, current limiter coming in and out. Also, where does the system measure the feedback voltage, Edge of the PCB or at the load? If it measures at the PCB then you may get an exceptional response at the PCB, but oscillatory at the load. If you measure at the load the inductance of the cables will impact the controller response and you may not be able to get as much controller gain. There was definatly the chance of other interactions and other parts of the circuit having more of an impact. Unfortunatly my experience is more focused on using accurate plant models such that you can a tune controller analytically… so it’s always awkward for me seeing heuristically setup controllers. It sounds like a good response anyway… if it’s on par with the Aglient that’s pretty good. PS Sorry for my english it’s not my native language. I have decided to exclude the pre-regulator for this version. The high voltage version is only going to be rated at 40v/2A so a maximum dissipation of 80 watts in the regulator. I decided not to do anything with the pre-regulator for simplicity. Perhaps a future version, I would like to design a variable Buck SM pre-regulator, but thats for another time 🙂 thanks for your comment and interest in the project. now you say that you haven’t noticed any real difference when changing between 50Hz and 60Hz, have you considered using an external clock on the F0 pin to increase the samplerate of the ADC? Are you using the ADC in continous conversion mode or do you read from it at certain times? In an earlier schematic i can see that you were using it in continous mode by connecting CS to ground. The ADC is in continuous conversion mode. I did not consider an external clock because as I understand it, increasing the sample rate effectively reduces the effective resolution. The design needs 21 effective bits at least to cope with the noise floor so increasing the sample rate would probably take me below that. The other thing of course is simplicity, one of the nice things about this ADC is its really easy to use. ‘Just a comment for anyone trying to get both the ADC and the DAC updated in one timer ISR in SPI master mode and ADC single cycle operation. – The DAC needs CKE = 1. Hi Gerry, my (selfish) motivation for doing the the ADC/DMA in one ISR was to give my NEW(!!) Fluke 8846A a workout. So I wanted tight timing on the read of the ADC and the write of the SPI. I’m still in the perfboard stage of the project and trying to sort out the accuracy issues vs the DAC, ADC, Vref, board influence etc. Isn’t the maximum intput voltage on the ADC below 5Vdc? The datasheet says FSet + 0.12Vref ~ 4.7V. Am I missing something? The voltage drop on the diode? Can you give a little detail on your communication between the psu and the controller/computer? Yes thats correct, the max input voltage is rev + a bit. Did I indicate something different? The communication between the controller and the computer is 8-bit serial ASCII at 19,200 baud. Really simple text based interface, I think I described it at a high level in one of the previous vids. The protocol is of my own invention so is probably not very well thought out – I am planning to cover the firmware and info on the serial protocol. I have not done this so far because the software aspect of this project is in many ways comparible to the early hardware prototypes, very loose and variable, once I have the hardware knocked into shape I will put a bit of effort into the software and make it more industry strength. No, it is just that the protection diodes is connected to 5v and ground. Doesn’t that mean the input to the dac could be higher than 4.7V? Ok, I’m looking forward to the video then 😉 I’m doing a little prototyping myself – experimenting with your design. I see what you are saying. As far as I can tell from the data sheet the max input voltage is Vcc + 0.3v so it should be fine. What happens if you put an input voltage over the reference voltage is it wraps around/overflows the reading, but I believe that electrically this is OK to go to Vcc. I just misread the datasheet. Thanks. 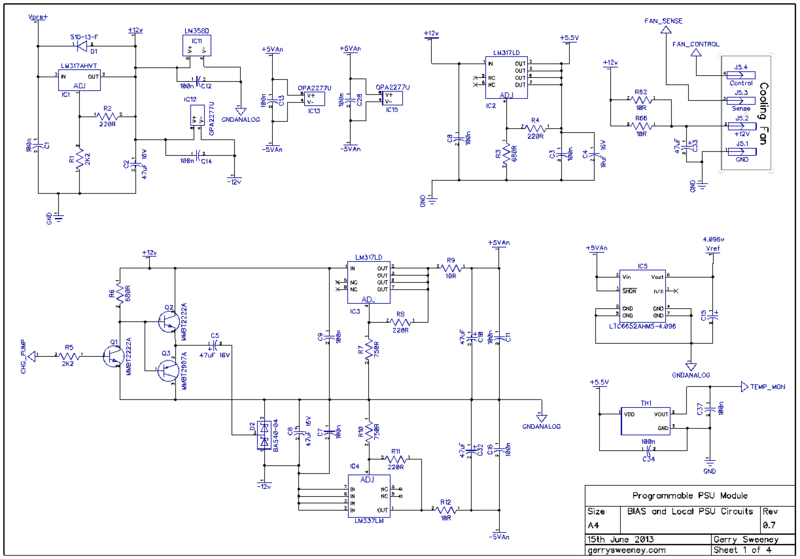 I could not use the NE5532 op amp because of the offset voltage, I am working down to a precision of 500uV and a 5mV offset is just too much, the NE5532 is more commonly used in audio applications or DC circuits that do not need high precision – I actually started the project using LM358’s which are comparable in many ways to the NE5532. Now if I had designed the PSU so that the regulator was not trying to precisely track the voltage reference then a high input offset might be workable, however, offset voltage in these devices often drifts with temperature so would be less stable over temperature. I like the look of the AD micro controller you pointed out – it looks interesting, I have not looked at that one before, will probably consider it in a future project, thanks for pointing it out. When can we expect the release of new parts? Does anyone have schematic of the pre-regulator such as that Gerry described? Hi, I am working on the PCB layout and need to build another prototype for the high voltage variant, I don’t want to modify the existing one so I need to build up a second one. The next video for the PSU will cover the firmware and software I am using, that should be in about two weeks from now – I will be away for a week and have some other commitments on my immediate return. How long are you going to keep us waiting? Put your frequency toys aside for a while and show your other great project as promised. The project is excellent, the posts are informative, and I for one am perfectly willing to wait. It’s not like one can have too many bench power supplies. If I need to get another PSU before this is done and I can build one, well, I just end up with an extra PSU. I love that you decided to use a PC CPU cooler for the heatsink. Too many people ignore them, and end up using overly expensive electronics heatsinks. I’ve found it’s pretty easy to drill and tap holes to allow screw mounting, the base of many heatsinks is certainly big enough to have the room. This can be easier than trying to make mounting posts. Also, for applications where one doesn’t need the fan they can be removed, and there are large heatsinks available for rather low prices. 1.why did you switch from mosfets to darlington transistors? i recall somewhere you said that mosfets are too fast but i dont understand why that would be bad. 2.why did you placed R46 in the voltage loop but we dont have the same resistor on the output of the IC12.1 opamp? is it because you want the current loop to be faster than the voltage loop? 3. what does R59 and R73 do? do they implement some kind of feedforward mechanism? hope you get the time and do the video on software and firmware soon. 1. Basically I needed a voltage drive so using a FET driver and a PNP darlington was the “least” component way of doing this using a FET as a driver. Also the PNP transistor is cheaper than the MOSFET I was using. But mostly though, its because the MOSFET needs a higher drive voltage to drive them hard on, you will see in earlier designs I was generating this higher gate bias voltage, but I dropped that to reduce components and complexity. The PNP solution works really well, you can see in the performance tests for current and response. 2. R46 provides DC current relief for IC12.1. Basically, when current limiting kicks in, IC12.2 will try to compensate but R46 limits the current which is being shunted away by IC12.1 via D9. 3. R59/R73 provide the driver with local negative feedback, in essence turning Q8 +Q4/5 into something like a linear-ish voltage amplifier. I think the complexity was because you had used an n-channel mosfet. it could have been much simpler with a p-channel mosfet or wouldn’t it? On the other hand Power dissipation capabilities of mosfets are much better, 50W for tip127 in comparison with 130-150W for irf540. i dont get your point about the higher drive voltage. first we dont want them hard on since it is a linear regulator and second of course they have a threshold voltage higher than the bjts but once you get past that voltage the current rise very rapidly and we dont need that much voltage.i think i miss understood you here. Possibly a P-channel MOSFET would have been simpler but I am not sure they are as easily available (cost wise) or as reliable because of their construction (although I am no expert). You generally do not see P-channel MOSFET’s in linear designs for this reason. I think the TIP36C is good for 125W from memory which relates as much to the physical packaging as anything else. I have a low voltage, high current PSU design goal, and for a MOSFET I would need drive capability to get a low RdsOn, which generally means a gate voltage of about 10V above the source voltage. In the low voltage PSU mode, (12V drain, 8V source under full 8A load) I simply did not have that headroom to get a low enough RdsOn so the BJT in this case works much better. Why not use one of these current sensors instead of that expensive resistor. They are about half price or less, no power loss and about 1% accurate and isolated from power path. Then about the choice for a different micro. Also ti produces a couple of msp430 with up to 7 24 bit adc’s builtin. And about another micro, somewhere in the beginning of the psu series, you gave a valid reason for starting with a pic, but because there were some other suggestions of micro’s here, I thought I chime in another that had higher resolution adc’s . PSoC’ are indeed another game, while the switch between a pic and a msp430 seems more like the same game with some rules changed. Anyway good luck with the acs series as I am thinking about using some as well. Will something like that (see the picture at link: http://imgur.com/IYUmhw3) work with your device? (yeah, it’s based on n-p-n structure while you using p-n-p transistors and probably somebody can change the schematic for p-n-p). I still can’t find schematic of good pre-regulator. Hey well done so far on this design. I have been following with a great deal of interest. Count me in for 4 of these modules if you sell them, even if they are just the PCB. Heck I would get the next revision if I could, just to play along at home. Have you thought of using an resistor array for your digital isolation? I can’t recall it being discussed in your videos, however it seems that all connectors are inaccessible once the board is mounted in a chassis. If for example these are mounted in a 19inch rack unit, it would be difficult to unscrew the module to gain access to the connections. Admittedly there are connectors such as http://au.element14.com/fci/20020618-m031a01lf/terminal-block-pluggable-3pos/dp/1788456 which can be utilised easily enough. However the serial and ICSP header are dead centre, perhaps if they were mounted behind the main filtering caps they would be vastly more accessible, as too the status LEDs. I apologise, I don’t know your grand intention and really I am inspired by this project and have purchased a great many components and evaluation boards, heck even a pickit 3. Sorry I am Atmel raised, and learning PSoC ATM. I see this as a fantastic education series, and even if you don’t release a kit, I think I will still endeavour to complete the project in house as many ideas you have presented are very sound. I have been following along with great interest, as I feel this represents one of the best examples of solid design, and your willingness to modify as you go along demonstrates excellent design flexibility, can’t half tell you have a programming background. A lot of hobbyists and pro’s could learn from this technique. Anyway, you are doing great work. Count me in for a sale of your product. Remember there are heaps of amateur experts and few field experts. Keep your chin up and I am looking forward to your next episode on this truly awesome project especially the XCode. On your work with the Rubidium Standard… Look up RDDS or reverse DDS, not my work but an excellent way to create a super clean 10Mhz reference. Thank you for your comments and kind words. I believe that the next board revision should be the last one (he says), once I have tested and verified I will get some boards made. I have not considered the resistor arrays while I am prototyping, its very convenient to be able to break into a digital line if you need to. I have optimised the board layout for hand assembly where I can, I might compact it further later on and then the RA’s might be a good option. The aim is the modules connections will be internal only, they would be brought out to the front/rear panel as required. Most likely I would solder the main power wires directly to the board. The screw terminals are easy in the prototyping stage. Right-angle pluggable connectors would be an option. I can’t route the ICSP and Serial connectors because the high power tracks are fencing everything in but this should not matter once the modules are installed in the final enclosure. I have recently considered board route outs, but the thought of two boards, and especially some kind of board interconnect has so far left me avoiding that approach. Hi chris, will do, thanks. Are your work in github or any other sourcecontrol site?, easier to download and peruse schematics and firmware. Just consider this as friendly encouragement, and put me down for a board when they are available. Yes absolutely, work has been very busy over the last few weeks so finding time has been really difficult, I intend to rectify this in the new year. Thanks for the encouragement and happy holidays. ‘Hope you are enjoying the Holidays. I’m just getting caught up on the changes & improvements in this episode and find I really learn something new and clever each time. One quick question: On the most recent schematics, the PWM V_Trim circuits from previous versions are now gone. Are these not needed anymore? If true, I assume it was because they were simply not not necessary due to the recent improvements. Can you comment? I apologize in advance if I missed it. Yes you are correct. When I introduced the PWM trimming I added this as compensation for input offset “current” on the LT1301. When I switched to the OPA2277U op-amp the input offset current was vastly improved and trimming to compensate was no longer needed so I was able to simplify the circuit. When you are working at these sorts of precision levels choice of op-amps becomes quite critical but there are so many options to choose from you often get led to the right part by tackling specific issues and addressing them. For this design very low input offset voltage and current characteristics are very important to maintain the integrity of the balanced front-end amps. Glad you can learn something from it though, thank you for watching and commenting. Anyway, something you might want to consider is what will happen when some idiot (take me as an example) goes and connects the output directly to a car battery. And then let’s REALLY make it tough by connecting the battery BACKWARDS . In order to provide that output they each require 4mA of base current. Given an AC supply of 12.5V and taking into consideration the 6k8 resistors on the base of each transistor (R54 / R55), I find it difficult to see how enough ‘oomph’ (base current) is available? Even if I was to directly short the drain & source of the FET I’d have difficulty seeing more than 2mA base current in each transistor which would imply a 4A maximum output. Assuming I’ve not made some ‘fundamental mistake’ (huge sigh!! I wish I knew more ‘stuff’), then I’d expect R54 / R55 to be HALF their current value and perhaps even halve that again to give a decent margin. (eg: 6k8 -> 1k8). Whether this would mandate any changes in other areas is FAR beyond my skillset. According to the on-semi data sheet which is more specific, the hFE of the device is 1000 absolute minimum, in practice though it can be (and obviously is) much higher than that and I believe in this configuration it is, although I have not checked the upper bounds of what that might be. In testing I was easy getting to 8A without saturating any part of the drive circuit based on the current values. However, a crappy TIP147 might challenge that, I see no reason not to increase the base current in the circuit to assume that the gain of the output device is only 1000, but the values of R59, R64, R71 and R73 would need to be re-worked. My original prototype and testing was based on the high voltage version (0-40v 0-2A) which is where the original values came from, I then worked on the low current configuration and found I did not need to change anything which is good for the BOM. When I do the next part I am looking at the high-voltage configuration again so I will be playing around in this area, I will make a point of demonstrating the measurements of this part of the circuit. Thanks for the feedback. Pretty much every Lab PSU schematic I’ve seen is inherently ‘single ended’ in nature. They can active drive the output to INCREASE the voltage, but they’re unable to actively DECREASE it. The simple fact that there must be some inherent finite delays in the feedback / control circuit ensures that there will be some finite degree of overshoot if the load steps up. Furthermore, if the load suddenly drops (to near zero?) for whatever reason, another overshoot ensues and it takes a finite time for this to passively decay. I’m seriously beginning to wonder if it’d be practical to use something like a Class-AB amplifier output stage instead of the single-ended series pass transistor? My ‘gut instinct” is that such a design could be made far more ‘tolerant’ of the (sometimes ridiculous) levels of capacitance and inductance that we place on the PSU output terminals. Just for fun, I might do some ‘experimenting’ (LTSpice first and then with some silicon). For the most part this is simply down to cost I think. What you describe is a perfectly valid PSU design, in fact if you do it right, what you end up with is a constant current source/sink device which would work equally well as a DC load….would be interesting to play around and see how useful that would be in practice. Of course you could not get all the way to zero although you could get pretty close if you use MOSFET on the sink side. Never really thought about the capitative load although my initial instinct would be you could still have problems, just like in an audio power amp if you try to drive capacitive loads. Obviously, such a device would cost more in parts, but I doubt it’d be a HUGE difference. I already have the zero volts output issue sorted… Just like your typical audio amplifier, I’m using a split supply. An interesting side effect is that the whole PSU becomes ‘bisexual’ since ‘it can swing both ways’. Another interesting ‘side effect’ is that it can become a crude form of AWG by modulating the V-Set input accordingly. (Obviously, any bandwidth limits of the Class-AB would limit output frequency capabilities). I’d guess that the fixed load (R60 in your design) would be implicitly provided by the quiescent current in the output stage. I’d envisage something like an Allegro ACS712 hall-effect current sensor. (1.2milliohm and bidirectional!) instead of a resistive shunt sensor. Anyway, enough of my ‘mindless chatter’, I need to get designing! Quick question. Did you have a chance to test your design for spikes during startup? Great project i enjoye the comments. if the pcp ths still available and where can i get a set. Thanks for your coorporation . 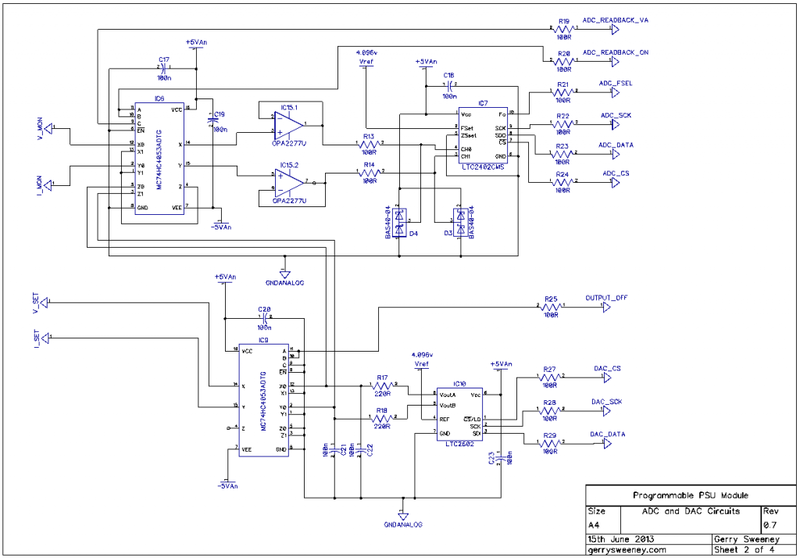 Have you considered extending your DAC->ADC feedback system to include the entire loop? This would form the basis of a VERY good ‘calibration’ routine in the firmware! I’m NOT saying you should eliminate the existing DAC->ADC feedback at all. I’m suggesting an ADDITIONAL option. Its already in the entire loop, it has remote sense capability in the design. When the voltage is being set the ADC ensures that the reference voltage is as close to the required value as possible. Once in read-back, its reading what the front-end sense amp is seeing which is the remote sense value. Maybe I am not understanding what you are suggesting? Let’s assume that we have the PSU set for 4V of output (thus implying that we’re setting a VRef of exactly 2V). In a perfect world, with perfect components, the feedback loop will do whatever it needs to in order to make the output exactly 4 Volts, but we live in an imperfect world with imperfect components. It might help my illustration by intentionally exaggerating these imperfections. Let’s assume that IC12.2 has a (ridiculously large) input offset voltage of 500mV! With our hyper accurate 2V of VRef being pumped into pin 5 of IC12.2 our device will do whatever it takes to attain an equilibrium. However, with 500mV of offset, this equilibrium will occur when pin-6 of IC12.2 has 1.5V (or perhaps 2.5V depending on the sign of the opamps offset voltage). Thus, when we set VRef to 2V, our actual output is 3V (or perhaps 5V) instead of the expected 4V. What I am suggesting is to include a calibration routine into the firmware that can characterise and save these inaccuracies (in the microcontroller flash) and then utilise these ‘cal points’ (with interpolation as required) to ‘trim out’ the introduced errors. Going back to the (hypothetical and ridiculously large) 500mV offset error in IC12.2, our ‘readback’ voltage of the V_Mon output would be 1.5V (2.5V) thus indicating an output of 3V (5V) at the output. However, our saved ‘cal’ data would apply a corresponding 500mV offset to the V_Ref generated by the DAC in order to eliminate the error in the feedback loop. For those lucky few with access to a calibrated, high resolution DMM, the calibration routine could also prompt the operator to ‘trim’ the DAC output at a few selected values (eg: 0V, 125mV, 250mV, 500mV, 1V, 2V, 4V and 8V). Your existing ‘DAC-trim’ subroutine would still be used at run time to accurately set the V-Ref and I-Ref points, but these values would be subsequently ‘biased’ up or down by the cal values stored in the PIC flash! In theory (ugh… Theory!!! ), I would expect the PSU could thus be able to ‘trim out’ a significant proportion of loop errors that were induced by ‘lower spec’ components within the loop. Heck, you could even use 10% resistors to set the geain and calibrate out any ‘static’ discrepancies! The primary requirement then shifts to requiring components with a great TempCo rather than with a great initial accuracy. I hope that better illustrates my thought process? Yes I see what you are saying now. So yes that would be possible but in my earlier experiments I found that lower spec components in the control loop did not yield linear results in terms of error offsets, especially as the opamps get pushed outside of their linear range close to the rails, so for that scheme to be accurate you would need to store calibration points throughout the range and take into account other factors like ambient temperature all of which have impact the specs. I selected op amps with very good specs for both input offset voltage, input offset currents and tempco and decided in the design I would make the control loop accurate enough to achieve the desired resolution as a linear design, then all I had to do was concentrate on generating a precision reference to feed in. I also really liked the idea of doing away with any need to calibrate in the first place, so with a reasonably selected voltage reference source and precision low tempco resistors in the front end divider thats the result I got which I was quite pleased with. I am sure your suggested scheme could be made to yield good results too though..
For those ‘finicky few’ who elect to take it one step further, it’s simply a matter of a firmware update to take it to ‘the next level’. You’ve no doubt analysed all those Agilent E36xx supplies that you’ve repaired. As you’d expect from Agilent (or whatever the heck they’ve chosen to call themselves this week), they are a very accurate unit despite the fact that they’re only using TL072 class opamps! With YOUR design that’s employing a far better class of opamp at the outset, the potential is there to ‘blow away’ those Agilent supplies in terms of raw accuracy. Those who aim to actually construct one of your supplies , has the option of ‘tweaking’ it to suit themselves. In my case, I’ll be wanting to do things like using VERY low tempco resistors. I don’t care what their ‘initial accuracy’ is, providing their long term and temperature related drift is (to use a kiwi phrase) bugger all! Give yourself a ‘pat on the back’ for this one! Very interesting project, learned a lot watching your videos. Excellent work on the power supply project! Can’t wait for another episode. On the power supply project I was wondering it you looked at other low offset op amps. ie the MAX44248 http://datasheets.maximintegrated.com/en/ds/MAX44248.pdf Only reason I ask it it’s ~$2 for a dual vs ~$5 for the OPA2277. Seems to have similar specs, unless I missed something obvious.. Always looking to save..
Do you think that would be a favorable alternative? Hope to see Episode 15 soon. Keep up the good work. that looks like a pretty good alternative to me, would have to test it but on the face of it not bad. I would say the prices of these things vary enormously, the OPA2277 is $1.7 at qty of 1000 according to the TI web site. As I mentioned a while ago, I am working on a similar project. I am having some annoying problems that I am having a hard time over-coming. I am using an Arduino but just to display voltage and current; VSet and ISet are done just with a voltage reference and then 2 pots to the respective OpAmps. I monitor current on the high-side using a TI INA225. http://www.ti.com/lit/ds/symlink/ina225.pdf Everying works fine without the Arduino connected. With the Arduino, however, the thing oscillates like a song-bird. It’s probably a layout issue – I’m still at the veroboard stage, but I thought I’d ask. Where does GNDANALOG meet up with GNDDIGITAL in your layout? your project is very interesting. Compare your schematic, in the former version 0.4a, it seems R4 and R5 set the voltage gain, but i did not see them in your new version schematic. Then how can you extend the output? Yeah its a bit more complicated, basically you set the gain around IC13.1 via R30,R31,R32,R34,R35,R39. Thank you for the feedback. Blimey thats a big PSU – 80Kw, whats it for? I do not have the final PCB’s yet, I have he next small batch which fixed all the last errors but I have not yet built them up, the project went on the back-burner because of other commitments. I have to clean up the source code and replace some proprietary code before I make the source available, I will see if I can get that done and post it somewhere. Sounds great, would love to see some photos of it when you have it built. – Ohmite series 10, 4 wire, 4.5 watt sense resistor. I picked that one so I could bend the two sense wires back into the analog plane. – The AC, rectifier circuits and op-amp supplies are still off board. – Indigo Terminal Emulator for I/O at the moment. Other than that, the design is essentially yours. I used larger case size MUX chips and a DIP OPA2227 in deference to my eyesight. It’s on a 3″ x 5″ PCB not including the power input circuit. Now begins the programming for best resolution and precision .. I’m not a good programmer. If you’re interested, I’ll be happy to send some photos. ‘Just let me know how to do that. Thanks again .. I’m having a great time working on this project. …. I’m very happy with that! In your blog, you noted that you tested stability into a “capacitive load”. How did you set that up? I’d like to try that as well. 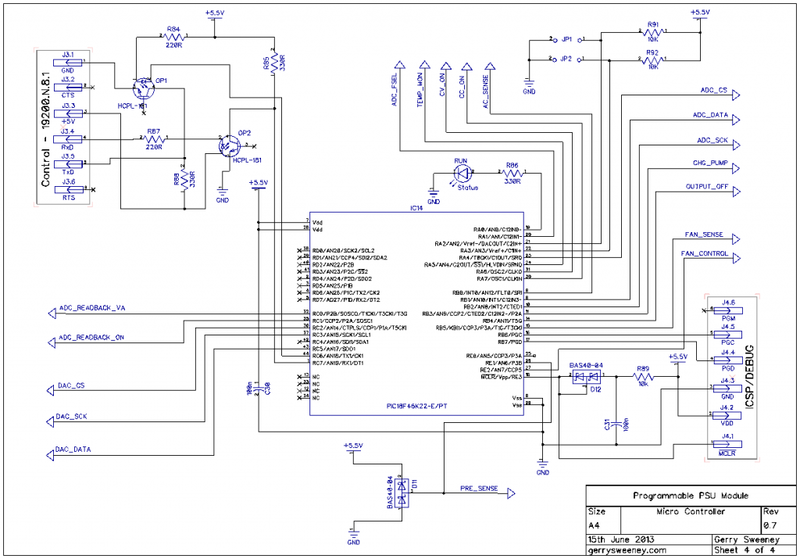 – Fix a significant noise issue from the PIC PWM to the fan. – Settle on a GUI. Given a thorough look online, you seem uniquely adept at using Qt as an interface with MPLAB X. No one, as far as I can see, has that working but you… well done. I’m looking into a graphical interface vs 2 LCDs with a touch pad and some encoder wheels. – V2 of the board. Given that this a floating supply, is there a chassis bond anywhere i.e. the front end of the transformer section? Thanks for the update, sounds like you have made good progress. Gerry, can I ask that you take a quick look @ sheet 1 of your schematic. Have you ever taken a look @ the LTC2404/8 ADC? It would allow you to totally eliminate IC6 and therefore the additional 100ohm resistance it inserts into the path. Also, if you used the ‘2408, (which has the same footprint as the ‘2404), you would have ‘spare’ channels available for monitoring a pre-regulator). The ‘2404/8 SDI pin could be tied directly to the 2603 SDI pin so it wouldn’t require additional MCU pins (even though there’s plenty available). I’d expect the overall BOM cost to remain about the same. There’s also a ‘2604 DAC available that has additional channels (which could be used for a pre-regulator if desired). However, using this part would simply increase the BOM cost in your current design that doesn’t need any additional DAC channels. I’ve assumed that TH1 (on sheet 1) is something like a Maxim DS60? Is it intended to measure ambient? Or is it thermally connected to the heatsink? You might find it useful to add a pullup resistor to the output-off signal.from the MCU. The LTC2602 DOES ‘glitch’ a bit upon power up so it’d be wise to force IC9 to select the grounded outputs as early as possible. On power up, the PIC pins will all be high Z inputs until they are instructed to become active outputs by the firmware. This would allow any glitch from the DAC to pass through to the regulator. Perhaps the output off signal should be ‘active low’ with the 4053 inputs swapped? Can I ask why IC15 (OPA2277) is setup as an input buffer to the ADC instead of an output buffer for the DAC? It appears that the DAC outputs each pass through two integrators. I’ve assumed the first one is to implement your DAC dithering and the second one with a longer time constant (inside the regulator itself) is to control PSU overshoot. As mentioned above, I’d remove IC9 and use an alternate output off method. I’d then merge the four integrators into two and alter the firmware based dithering to suit. Footnote: I’ve viewed DOZENS of lab psu schematics on the web and yet I still keep coming back to your design. I guess that’s because yours is the closest I have found to what I consider my ‘ideal’… Good work! I’m patiently looking forward to seeing part 15 in this series. Yes the labelling is wrong, I was using simple preferred resistor values, so the voltages are not critical, and so are a bit higher than the nominal. I had not looked at the LTC2404/8 ADC before, looks like an interesting part, and as you say, could be made to work and could eliminate IC6, but I would still need to do something with the output off. Yeah I could probably tweak the output off circuitry around a bit, a pull-up or as you say invert the logic. The ADC needs a very low impedance source to maintain accuracy, so its a simple voltage follower to get the drive current needed to allow the cap in the ADC to charge properly. Accuracy goes to pot without it. You will see on the ADC you suggest they bring the output of the mux out on a pin, that would be for the same reason, although you would save on one element of the op amp there. The outputs of the DAC’s drive the two integrators which are in the feedback loop of the V and I regulators, these integrators are the heart of the regulation, the integrators play no part in the dithering but the simple low-pass filter R38/C38 and R36/C42 smooth out any dithering ripple from the DAC. Using a 2404/8 removes the need for IC6 irrespective of the output-off handling. (That’s IC9 rather than IC6). However, I also alluded to possibly changing the output-off to be a relay (which would thus eliminate IC9 too). While I completely understand that you need IC15 as a buffer, it’s my suspicion that it’s only needed for the DAC readback os I-Set and I-Set. The remaining two inputs to the ADC (V-Mon and I-Mon) are already the low impedance outputs of existing opamps and therefore should not require buffering. By rearranging IC15 to become a DAC output buffer instead of an ADC input buffer, you’d still be feeding the ADC with the low impedance source, and you’d be able to use the same low impedance source to drive the regulator itself thereby possibly slightly improving the accuracy within the regulator section too. BTW, the examples in the 2404/8 datasheet in front of me only show ‘gain stages’ between the mux output and the ADC input. In all other examples (where the gain is implicitly unity), it shows a direct link from mux to ADC. It’s noteworthy to mention that the ‘on’ resistance of the 2404/8 mux is in the same ballpark as the 4053 (circa 120 ohms with VCC=5V), so I’d agree it might be useful to include a single voltage follower between mux and ADC. Sounds to me like a good justification to use an quad OPA4277 (or similar) instead of a dual OPA2277? I’ll be using a low end Atmel as the primary CPU with similar opto-isolation. (No real reason – Just felt like it). The whole PSU ‘module’ can be run as a standalone PSU unit by plugging in a couple of rotary encoders and a simple HD44780 style LCD, but can also be combined with additional ‘clone’ modules along with an ‘upstream’ CPU providing the control using the isolated serial interface. (i.e. This allows multiple ‘modules’ to be centrally controlled and provides a much nicer graphical LCD display akin to PSUs such as the Rigol DP832a). 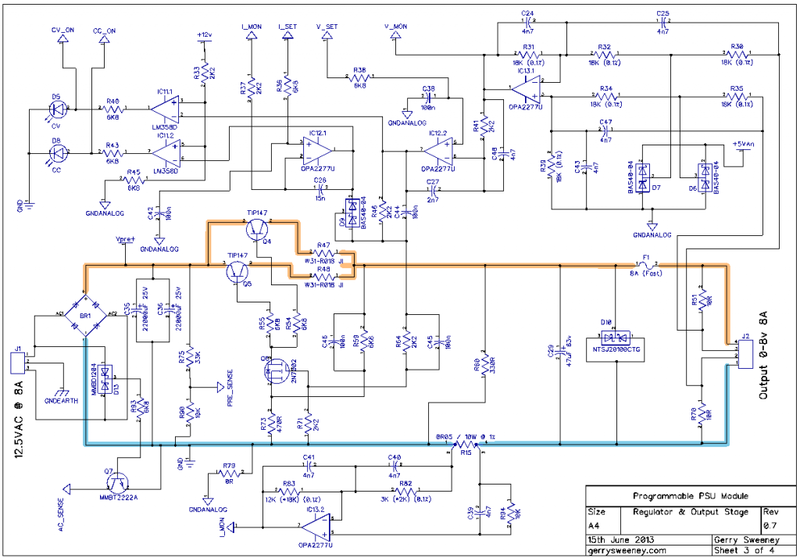 I cant remember for specifically but from what I recall the on resistance of the 4053 was a problem for the ADC, the DAC has no problem driving the error amps but probably did have a problem driving the ADC too which is why the buffer ended up being where it is. The ADC has incredibly low impedance at certain points in the sampling period, easily measured with even a small resistance between the buffer and the ADC, you can certainly see it across the switch. That being said a lot of evolution happened so I can’t really remember but its generally a very good idea to drive the ADC with a buffer. Thanx for the ‘heads up’. I’ll make sure to include a basic voltage follower between the mux and ADC sections of the chip which is a ‘2408 in my case so I have ‘spare channels’ available for use in a pre-regulator. If you’d like, I’ll report back with my findings once the components have arrived. I know you are a busy man, and you run a successful business. Just wondering if you will be making/updating this project soon or have you finished with it for now? Thanks for sharing the schematics. I’ve got a question about the pre-regulator. Is it present in this revision? I cannot find it on the scheme. If it is not there, what AC_SENSE is for? Did you ever have a PCB produced for this power supply? I’d be really interested in buying one. Only prototypes I am afraid, I have got a few bare boards but of the most recent revision which shamefully I have not built one up yet as I was not 100% happy with the mechanical construction. I would not be comfortable making them available at this stage. For me, this is a very cool project and is worth getting your own board(s) made. The board will eventually need to be customized anyway depending upon your own preferences for displays, device package preferences, convenience, processor, bells, whistles, etc. I built it up a year ago and have been using it as a hobby/academic platform since. Why? I wanted to study the PNP stability compared to circuit simulation, etc. In a nutshell, it is stable for the loads I have tried (7.5v, 7.5A) for two main reasons: From the datasheet, we see the gain of the TIP is increased as the current is increased (too much is not good ) but, in the drive circuit there is some negative shunt feedback to the FET that helps reduce that effect. More importantly, the output capacitor (think capacitance AND ESR) adds a very early bandwidth limiting pole while the there is plenty of phase margin remaining. The cap can be reduced in value to help with the load dumping response but that may trade off with the stability. The only (minor) oscillation I see is as the CC/CV voltages get very close (the DAC resolution is very fine) there can be some oscillation of the cv/cc circuit within a very tight band. If I recall, ~ 1mv as the two op-amps fight for control. ‘Best PSU project I’ve seen. Woops, correction: The output cap with correct ESR places a low frequency “zero” … not “pole”. Hi Gerry, this is an amazing project! congratulations!! P.S. Are you still alive??? are you planning to make some update to this project? Yes I am still here 😛 Just work commitments have taken over. I do have PCB’s to build the next prototype and tackle the higher voltage version of the PSU but time is a challenge at the moment. The last changes to speed up the response adds quite some capacitive load to some of the OPs. A more normal change would be a resistor in series with C27. Also symmetry in the capacitors around U13.1 can be important. So tolerances of the capacitors can make a big difference. There is a preferred direction to go out of symmetry: e.g. C47 should not be larger that nominal, slightly smaller can be an advantage. It might also help to have faster OPs for OP13.1 and especially OP13.2. Usually a slight offset of the OPs should not be a problem as software can take care of that. The NE5532 might have to much drift at some places. Another point to look at is the capacitance at the output. Here it can make a difference if the capacitor is low ESR or not. Usually there should be film or ceramic type capacitor directly at the output (to keep RF signals out and provide the very fast response). Hi, thanks for the comments and suggestions. First at all, many thanks for share PSU project. I really learn a lot with your comments. I followed your project but I did’nt find software. Had you share it? Hope you can complete this project soon. I wanted to ask about the need for multiplexers with the ADC\DAC? What kind of capaciators are C24,C25 etc. ? I built the power supply from your project but it does not work properly. I have a sawtooth signal at the exit. Can you help me? Sorry to hear it is not working for you, it is very difficult to diagnose something like this by looking at a diagram if you have a square wave on the output that would suggest its oscillating, there could be a whole bunch of reasons why that is.